Because feeding specialization among marine herbivores is rare, marine communities provide a simplified system for identifying factors selecting for specialization. On Australia's Great Barrier Reef, we investigated interactions among the chemically-defended seaweed Chlorodesmis fastigiata, herbivores specialized on this alga, and potential predators of these herbivores. Chlorodesmis is a low preference food for reef fishes but appears to be the only food of the crab Caphyra rotundifrons and the ascoglossan gastropods Elysia sp. and Cyerce nigricans. The crab is found only in patches of Chlorodesmis, feeds solely on the alga, and selectively shelters in it in laboratory choice experiments. Crab grazing on the red seaweed Acanthophora spicifera was stimulated when this alga was coated with increasing concentrations of the cytotoxic diterpenoid chlorodesmin, the major secondary metabolite of Chlorodesmis. Crabs did not sequester Chlorodesmis metabolites but avoided predators by sheltering in the unpalatable alga. All crabs tethered on the reef without access to Chlorodesmis patches were rapidly eaten; those with access to Chlorodesmis patches were much less susceptible to predation. The cryptic ascoglossan Elysia sp. was found exclusively in patches of Chlorodesmis and sequestered metabolites from the alga. Living Elysia were unpalatable to the common wrasse Thalassoma lunare in laboratory assays, but the crude organic extract of Elysia did not significantly deter feeding by Thalassoma. Elysia sequestered chlorodesmin, which deterred feeding by reef fishes in field assays but was ineffective against Thalassoma in laboratory assays at 5% food dry mass. Unlike Elysia, the aposematically colored ascoglossan Cyerce nigricans sequestered Chlorodesmis metabolites in relatively small amounts, but produced larger amounts of unrelated polypropionate compounds. Cyerce were never attacked by fishes and the crude organic extract of this slug strongly deterred feeding by wrasses in laboratory assays. The dorid nudibranch Gymnodoris sp. was found only in Chlorodesmis patches and appeared to be a specialized predator on Elysia; it would not prey on Cyerce. Data from this and other recent investigations demonstrate that some small marine herbivores feed selectively or exclusively on seaweeds that are chemically defended from fishes. 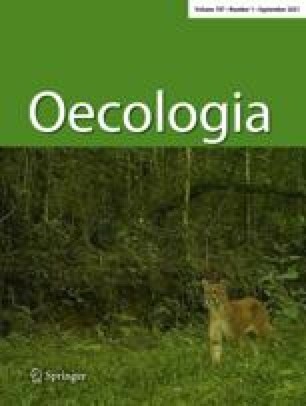 This association reduces predation on the herbivores and suggests that escape from and deterrence of predation may be a dominant factor selecting for specialization among these herbivores.